If the Shoe Fits… Organize it! Am I the only one who thinks about organizing this time of year? As a person who teaches people to think systematically, you might get the impression that organization comes easily to me. Unfortunately, it doesn’t. Don’t get me wrong, I LOVE to be organized, it’s just that I’m not a natural. Before kids, I spent many hours keeping up with my “stuff.” After kids, my “stuff” and their “stuff” took over!!! Ever since the “stuff” took over, I have been attempting to impose some sort of system of organization on it. 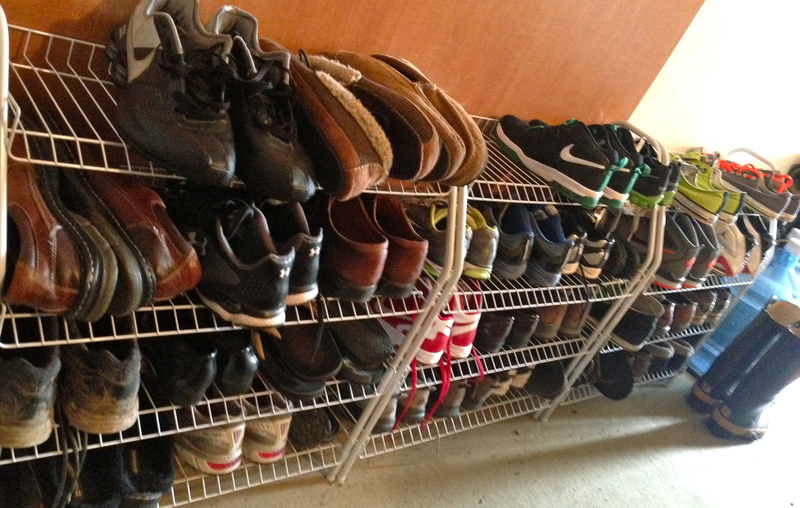 This may sound crazy, but one important area of organization for our family involves shoes. As a family of five, we have a lot of them! In addition, I have a son who feels like some women; one can never have enough shoes. 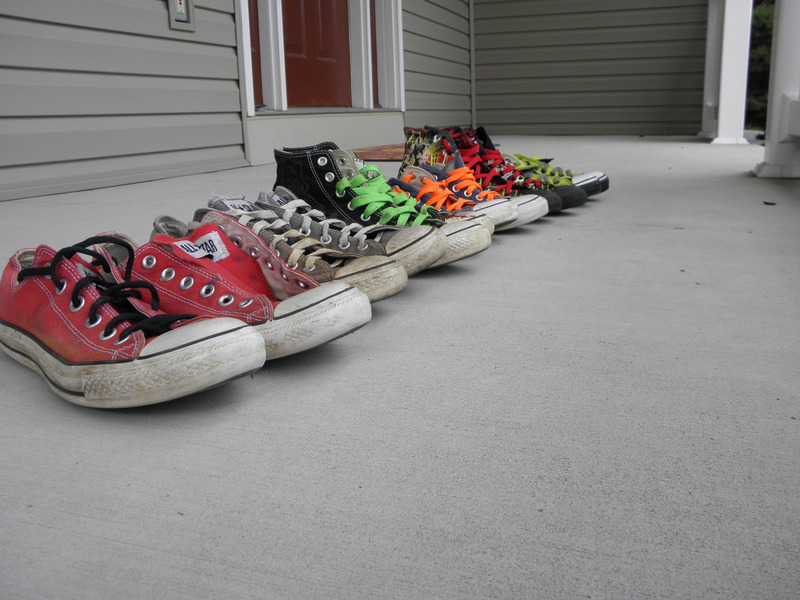 In fact, my son even photographs his shoes. 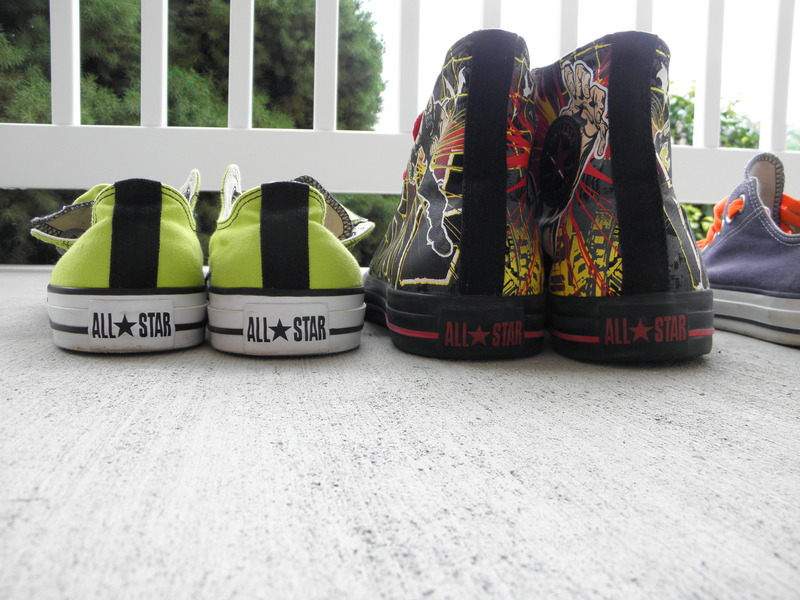 Note the closest pair in the photo…his prized one of a kind self-designed Converse! 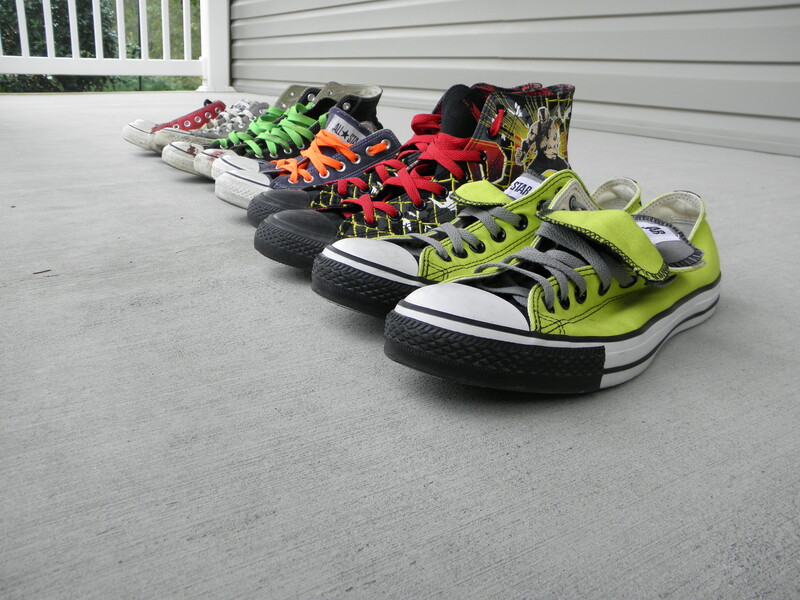 Keep in mind, this is just one of his shoe collections! 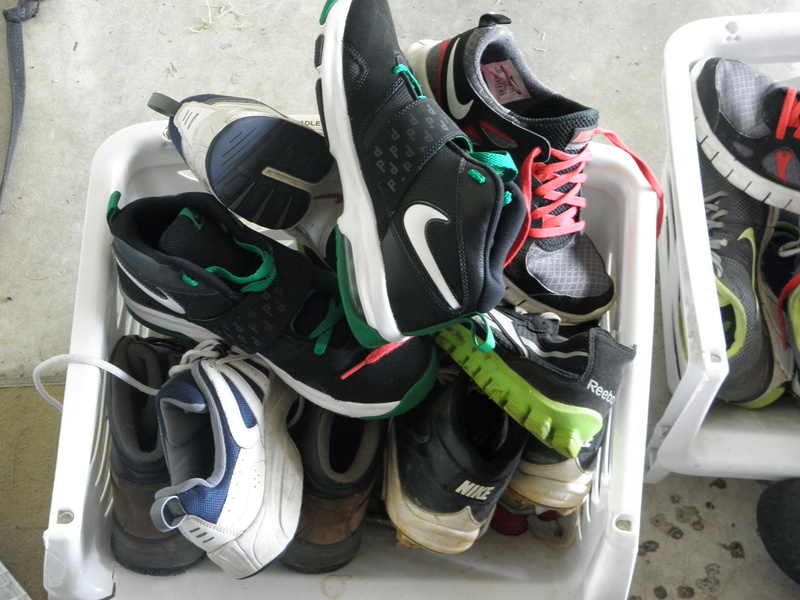 From the beginning, our boys have been trained to remove their shoes in the garage upon entering the house. I’m not sure why, because neither my husband nor I removed our shoes prior to entering our homes of origin. I will say that this habit has cut down on cleaning and the mal odors that tend to emanate from active boy’s foot ware. It has also help preserve the carpeted areas of our home. But, this practice has also caused strife with having to nag the boys to take their shoes up to their bedrooms and then locate them again when it was time to go somewhere. It was then that we decided that we should just store the shoes (other than their “Sunday” shoes) at the door leading from the garage in to the house. When the boys were little, this was not that big of a problem as we were helping them on and off with their shoes, their feet were tiny, and they only owned two to three pairs of shoes in total. 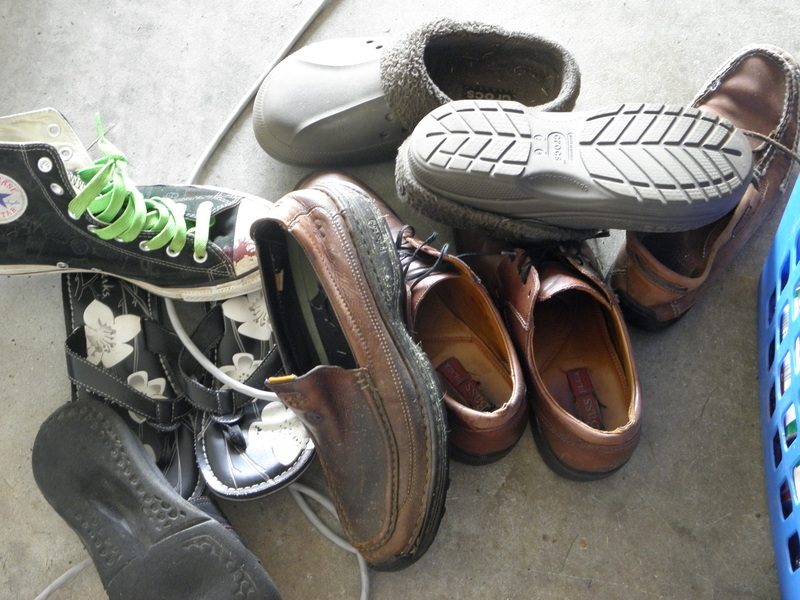 As they grew, they each accrued many pairs of shoes, and we were no longer supervising them as they removed them. This led to chaos in the entryway! The quest to determine the best way of organizing all of these shoes was on. We needed a system that would allow us to easily find and store each pair of shoes. Initially, I used stackable plastic bins. I even labeled each bin thinking that it would help the boys remember to put their shoes in their individual bins when removing them. Okay, I’ll admit that some of those shoes belong to my husband and I. We only keep a few pairs of shoes in the garage; the rest we store in our bedroom closet. The bins were too small and the shoes became jumbled up, spilled out and difficult to locate. At this point, I can’t tell you how many times I twisted my ankle attempting to enter or exit our home; not to mention the frustration in locating a pair of shoes when in a hurry. I had to figure out a better system. Some of the “systems” I considered wouldn’t work. Width-wise we don’t have that big of an area at the doorway, and I didn’t want to “break the bank.” I finally found a 4-tiered shoe rack that was affordable, durable and a perfect fit for the space! We needed 3 to accommodate all of those shoes! I purposefully included the winter boots in the photo as they will not fit on this rack. We store our winter boots on a tray just beyond the racks in the winter and in our attic over the garage in the off-season. I really like that this rack has shelves. Many of the affordable options that I had considered had open rods for shoe placement; I could envision shoes slipping off the rack and on to the floor. I also appreciate how sturdy these units are, as some of the racks I looked at would not have held up to teen boys! 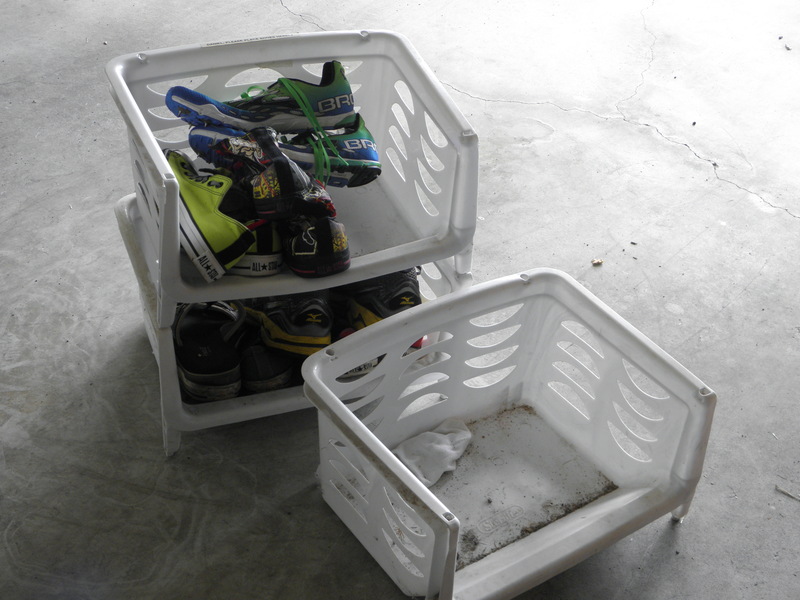 This system allows easy access and storage of each boy’s shoes with a few extra slots for my husband and I (although I did have to convince my husband that he didn’t need 3 pairs of back up mowing shoes;-). I completed this project back in September, and I have to say that it’s the best solution I’ve come up with so far. It’s so nice to be able to enter and exit our home without spraining my ankle! Purchasing information for the shoe racks: I purchased mine at Home Depot. However, you can go to Amazon.com and search 4-tier shoe rack and quite a few options will appear with prices ranging from $12-$30 per rack. I loved this! Literally laughed out loud! I know how you get into organizing as the New Year begins too. Great solution for the overabundance of shoes! This piece came as perfect timing ~ my husband and I are getting ready to redo the foyer/entranceway to our home, including the mudroom-type, catch-all closet. Now, I know what I am going to do with all of OUR shoes! Thank you, Mary Ann! I got to thinking after I wrote this that this shoe rack is probably not near as “high end” or fancy as some (I’ve seen the closets on Pinterest! ;-) It’s definitely practical though. For a garage, it’s been a perfect solution!! !